Dorothy Gale plunges into adventure again, this time with a talking chicken named Billina. Dorothy and Billina are washed off their sailing ship to face drowning, starvation, and screaming Wheelers, strange men with wheels instead of hands and feet. 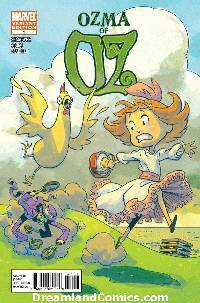 The multiple Eisner Award-winning and New York Times bestselling team of Shanower and Young returns to Oz with this comics adaptation of L. Frank Baum's third Oz book.